I met Mary because of her dog. He’s a friendly dog with a job to do. I discovered she was a gardener and the usual topics came up—plants, the weather, our soil. When Mary invited me to come see her garden, I jumped at the chance because I hadn’t visited a garden like hers before. 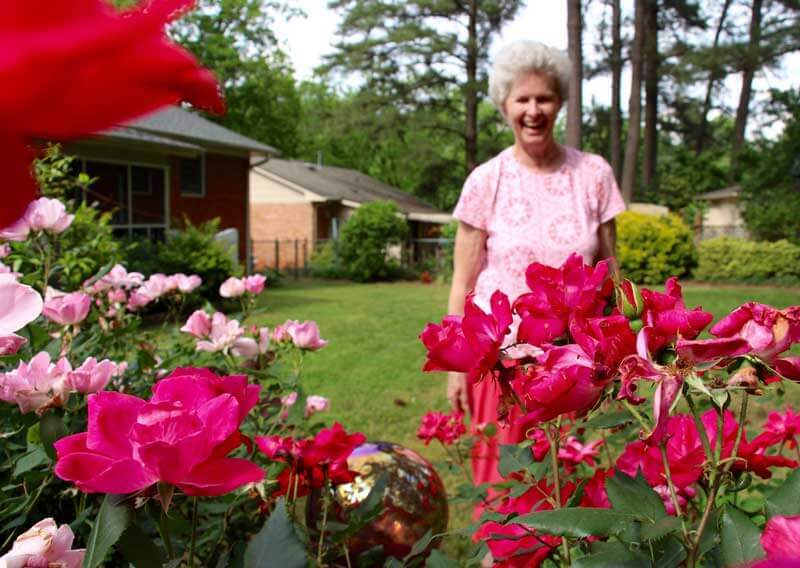 Mary and her husband live on a half-acre lot in north Raleigh. Beautiful perennial borders frame green turf where her dog plays. Mature trees provide dappled shade and a swing beckons. But I couldn’t figure out the yard art until Mary took me outside for a little tour. Mary is completely blind and the art in the yard serve as guideposts. “I don’t use any type of assistance when I’m in my yard. I just tune into the sounds and feel how the earth is under my feet,” she explained. Stone boarders define her beds and strategically placed stones provide access into the beds and keep her plants safe. Looking at the stepping-stones I realized something else. There were no weeds. “I’m pretty persistent against the weeds,” she said. Then her husband revealed Mary’s secret. She gardens at night. Mary confessed her husband finds her out in her garden well after dark happily pulling weeds. “It’s cooler,” she says with a smile. She may have lost her sight, but she’s found extra time. I turned to Dr. John Dole of NC State’s Department of Horticultural Science for a tutorial in floral fragrance. Dr. Dole’s work centers on commercial flower production and he began by explaining a flower’s scent is created by a variety of chemicals, which evaporate into the air. We may find that scent pleasing, but flowers don’t care about us. They are attracting pollinating insects to help them complete their lifecycle. An afternoon in Mary’s garden made me realize that maybe fragrance should be at the top of my list the next time I buy a plant.